Delivery from £5.00 to United Kingdom in 4 - 7 working days. 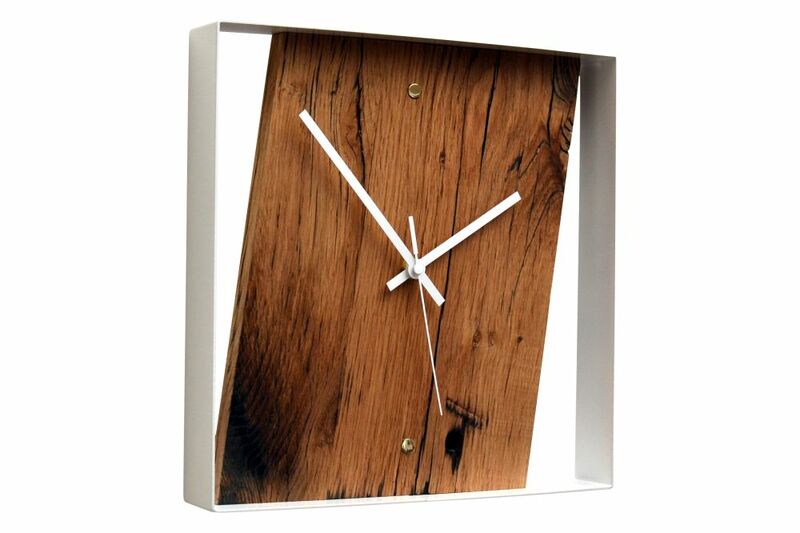 The Oak used in this clock originally served as flooring and walls of French Railway Wagons. The clock is framed within a gloss white powder coated aluminium frame. The clean geometry of the folded metal contrasts beautifully with the mottled unpredictable surface of the timber. The gloss finish helps to accentuate the character of the reclaimed French Oak. We inlay hand machined and polished solid brass inserts to denote 12 and 6 o’clock. The clock uses a quality Quartz movement. The Oak used in this clock originally served as flooring and walls of French Railway Wagons hauling goods for the SNCF (Société nationale des chemins de fer français). These wagons are up to 80years old and are nearly all now decommissioned and replaced with less romantic steel versions. When we first get our hands on the Oak boards they are coated with decades of soot from the old steam trains that hauled them. Hiding under that soot lays an incredible timber full of characterful burls, knots and cracks. Time has allowed the soot to seep into the cracks and holes beautifully highlighting them in jet black. The larger blackened holes in some of the pieces were created when red hot rivets were forced through the timber to join them to the steel frames of the wagons. This process was used in the days before mechanical drills were portable or practical enough to do the job. The charred edges of these holes are a fantastic feature that really helps to describe their past.